Pictured above are Donna Overland, President of North Valley Credit Union and Roy Spence, CEO & General Manager of NVCU presenting a cheque for $ 10,000.00 to Daniela Fiske and Kim Rutzki of St. Anthony’s Hospital. At a recent meeting of the Board of Directors one of the Directors who sadly had to make use of the Palliative Care Unit at St. Anthony’s Hospital commented on how the facility could really use an upgrade to the furnishing. The idea being with that with new furnishings people visiting their loved ones could stay longer and perhaps even overnight if the furnishing could facilitate this. The Board of Directors made a motion to donate $ 10,000.00 to the Palliative Care Unit at St. Anthony’s Hospital this December. 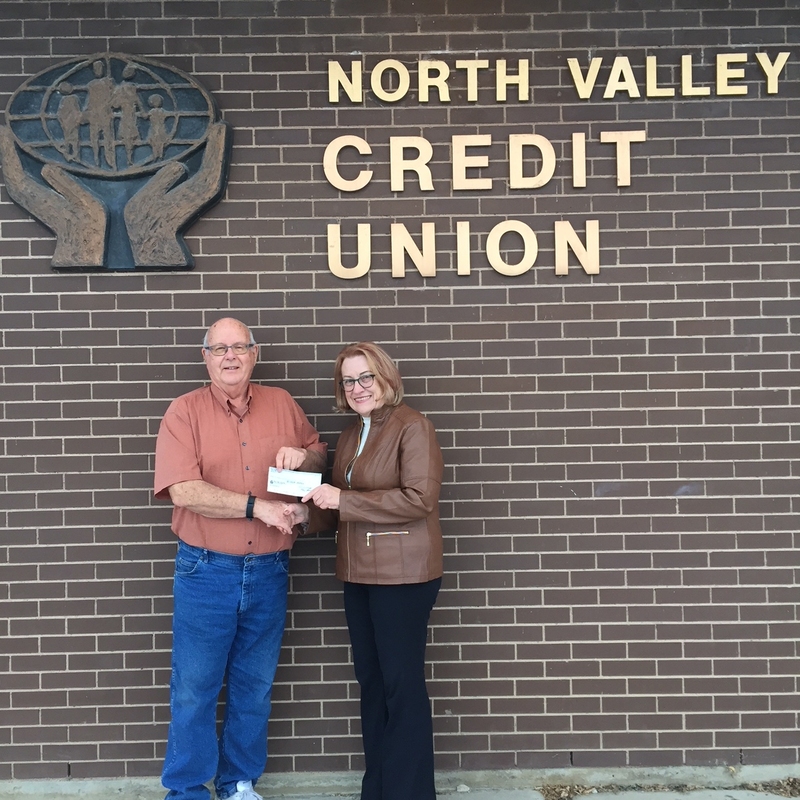 This is another example of how North Valley Credit Union “gives back” and supports the communities we serve. It also fulfills one of the co-operative principles which is “Concern for Community”. Donna Overland, on behalf of the Board of Directors, wishes to thank St. Anthony’s Hospital and all those people who work there for providing such a vital service to our community and the district. On the morning of Monday, October 1st, approximately 60 seniors gathered together at The Golden Jets Centre in Esterhazy. They were there to celebrate another example of Mosaic’s willingness to support local communities, and they were also there to learn something that could potentially save a life. The key ingredient in this story is the acquisition of a defibrillator, which is now prominently located in the main foyer of the hall. This life-saving piece of equipment will not only be available for those attending the Golden Jets facility (should they need it – which everyone hopes they won’t! ), but it may also become vitally important in the event of the building being used as a refuge center for the nearby Sumner Place Senior’s residence. The road to obtaining the defibrillator began in January this year with the simple intention to get one! As this intention was communicated to key people, the ever-helpful Don Hood entered the picture. He pointed the way to the Mosaic grants website, but freely admitted that navigating the application process was a task best left to someone else. Then, the daughter of Ceone Martin (The manager of the Golden Jets) stepped up to the plate and completed the necessary application. The grant was approved, and a donation of $5000 was made to purchase the equipment. And so to the event. People started arriving at the centre around 9:30 in the morning. There was plenty of convivial conversation to be had among friends, and during this period the small team from Canadian Industrial Paramedics prepared their materials and equipment for the workshop. Just before 10:00am, Ceone introduced paramedic Rae Wallace, and then the workshop began. 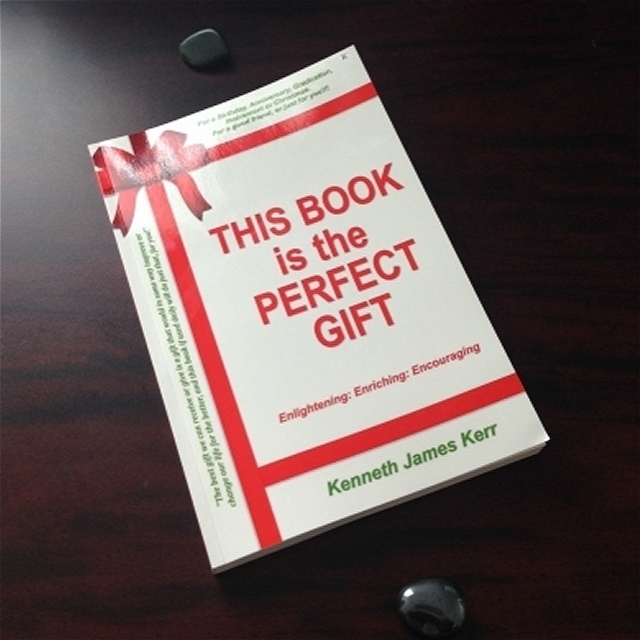 Not only was the quality of the material worthy of note, but so also was the rapt attention of the audience. You could have heard a pin drop when Rae Wallace was speaking. And, when instructional videos were displayed on the wall, all eyes were on those presentations. Needless to say, the functioning and operation of the Cardiac Science Powerheart G5 Defibrillator was fully explained, but it was also clearly emphasized that a call to 911 should be the first action in an emergency situation. While expeditious use of the machine is vital, it must never be used in isolation from the assurance that trained professionals are on their way. Also part of the presentation was a brief refresher in CPR, (Cardiopulmonary Resuscitation), right down to the use of special mannequins during the demonstration process. After the formal presentation, the paramedics went from table to table to more closely demonstrate the equipment and CPR techniques to the attendees. This also allowed for more questions to be asked on an individual basis. Around 11:00am, the K3 Underground Expansion Manager, Philipp K. Gauer arrived for the taking of the official cheque presentation photograph. 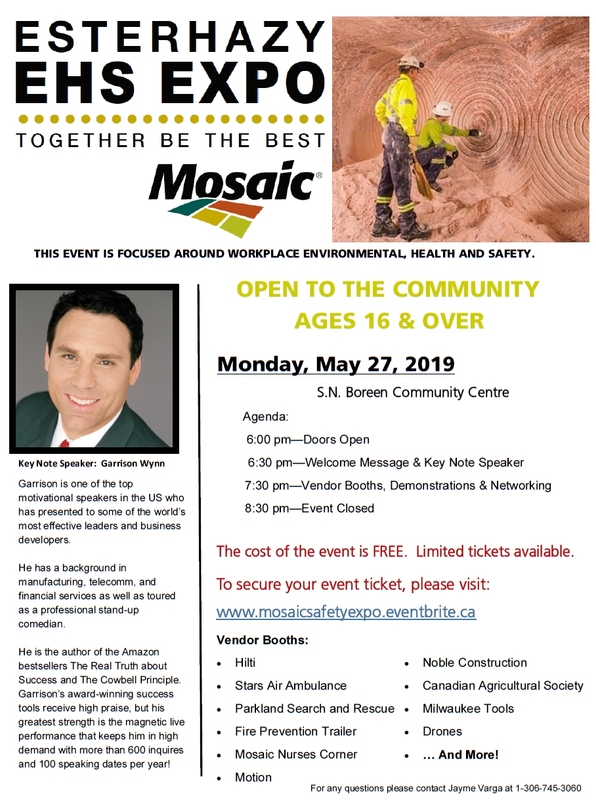 As a local man who has returned to Esterhazy, Philipp exudes a genuine love for the area, and is the ideal person to communicate Mosaic’s commitment to support the local communities in which they operate. His photograph with Golden Jets president Carol Helmeczi appears in the header of this article. Later, in his address to the audience, he expressed that when the request for help was received at Mosaic, it was simply a “no brainer” for them to respond positively. He said it was an “absolute pleasure” to help, and to give back to the community. Door prizes were then awarded in the draw, and a catered meal was enjoyed thereafter by all. Ceone’s daughter Kathy from Winnipeg. Lawrence Berthelet, the Director of K3 expansion, Mosaic. Charlene Persson, Lawrence Berthelet’s Admin Assistant. Rae Wallace and her team members from CIP. Philipp K. Gauer, K3 Underground Expansion Manager. Below, there’s a small gallery of images taken at the event. Click on any image to open the picture viewer. You can then navigate through the images. The St. Anthony’s Hospital Building Fund has received another significant donation from North Valley Credit Union. A cheque for $20,000 was presented to Don Hood by NVCU President, Donna Overland. Need to regenerate and get your zen on? The Boreen Centre may be the place to go on Tuesday nights, from 7:00 to 8:00 p.m.. That’s when “Hatha Alignment Level Yoga” will take place. According to the Rec. Director, the yoga is “Ongoing every month, every week.” Should that change, we will let you know. 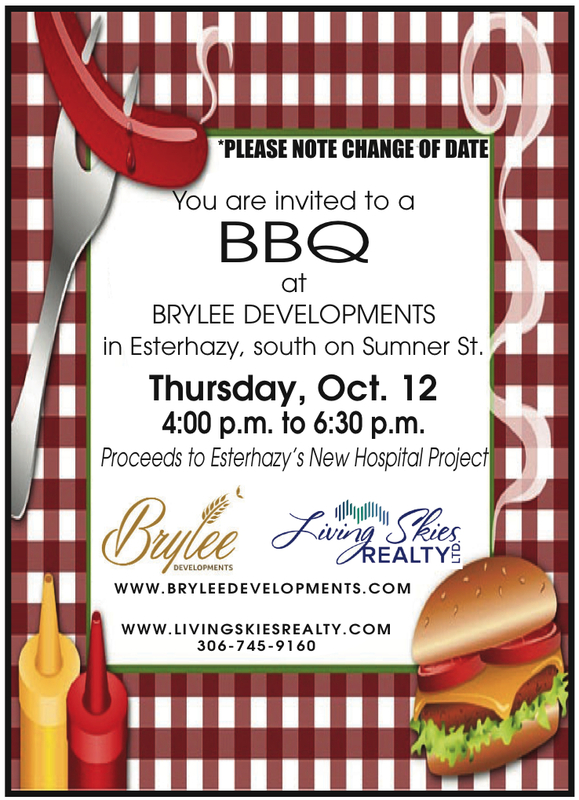 The fundraising BBQ which was originally set for Oct 2, has now been re-scheduled to OCTOBER 12 at Brylee Developments. The proceeds are going towards the new hospital/carehome project. See the revised poster below. Recently, the Rural Municipality of Spy Hill pledged a second donation of $600,000 towards the hospital and care home project in Esterhazy. In this picture we see two cheques being displayed to signify the now $1.2 million dollars being donated by the RM. In the picture:- Back row: Glenn Blakely – Councillor, and Don Hood. Front row: Don Bernath, Jack Neyedley – Councillor, Cheryl Odgers – Councillor, Bob Bruce – Reeve, Corrine Delmage – Councillor. Missing from picture is Marsha Sabo – Councillor.